The Raven Pro Ice Axe (hereafter called the Raven or axe) is a lightweight ice axe aimed at mountaineering and alpine travel. It carries a �B� rating (basic), as opposed to the more stringent �T� rating carried by technical ice axes. 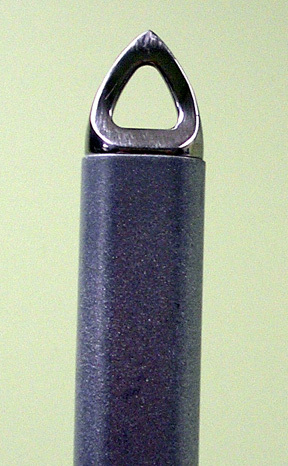 It has a straight silver colored shaft made of 7075-T6 aluminum. The Black Diamond name and logo are on both sides of the shaft. The cross section is oblong in shape, with the longer flat shape perpendicular with the head of the axe. The head is made of stainless steel. The company makes a point of noting that it is not stamped and bent. This is to emphasize the strength of the axe. A hole in the head at the top of the shaft but below the pick and adze allows for a leash to be tied on to the ax. I made my own of nylon webbing. A slightly down curving, 5.9 in (150 mm) serrated tooth spike is on one end of the head. It is a neutral-clearance pick, meaning it has a tip that is parallel to the shaft. The other end has a 1.75 in (44 mm) wide, 3.25 in (83 mm) long adze for chopping steps and such. The adze has a diamond shaped hole in it to help reduce weight. The B rating symbol has been cast on the underside of the adze, as can be seen in the picture below. At the other end of the shaft is a 1.3 in (33 mm) stainless steel spike. It too is cut out in the center for further weight reduction. This axe has been with me on almost every winter and spring hike for the last three years. I have had it in many locations in the eastern Sierra Nevada. I used it on Mount Shasta, Mount San Gorgonio, and many times on Mount San Jacinto and its fellow peaks. I take it on our yearly attempt to climb White Mountain, CA in the middle of winter, a 66 mile hike and climb that has so far eluded us. I have used it on packed snow, frozen snow and glacier ice. I spent two days on Mount Morrison with a private guide learning to really use the Raven. The weather conditions encountered with the Raven in hand have ranged from chilly 4 F winter mornings to beautiful 40 F spring days. 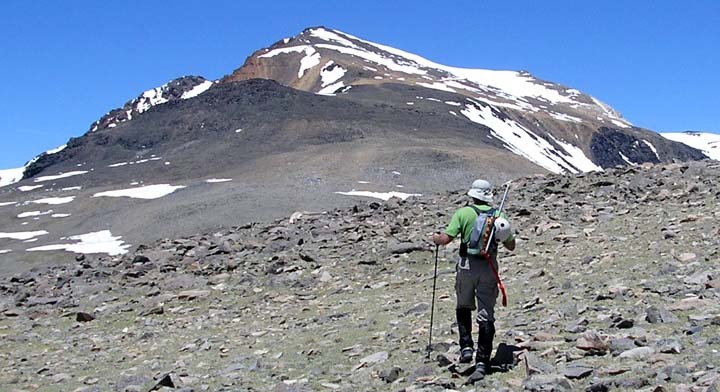 I have carried it at elevations ranging from 7,500� to 14,000� (2,286 to 4,267 m). 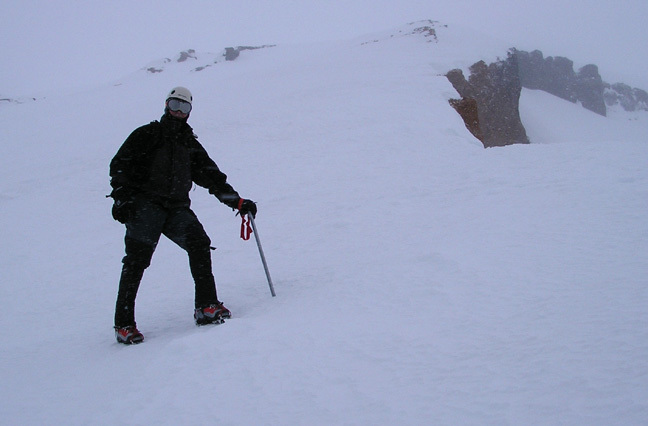 I bought the Raven Pro to replace a much heavier technical-rated ice axe that I bought back in the 1990�s. I got it for the weight savings it offered. I felt that I did not need the �T� rating of the older axe. I like the finger grooves that are formed by the casting. It is a comfortable axe to have in hand for long stretches of time. I have not had much opportunity to use the Raven except to practice (thank God). I try to get at least one day of practice each winter, usually on Cornell or Jean, up near Mount San Jacinto. Although, as I mentioned earlier, I got the ice axe workout of my life during a two-day private guide session that my brother-in-law and I did on Mount Morrison. By the end of that trip I could use the Raven with either hand from any position of a fall, in ways that I had never thought of in the previous twelve years. I also learned better ways to use the Raven as an anchor for belaying, or anchoring a tent in avalanche prone areas. I use it as an anchor quite often. A common example is attaching my gear sled to it in the White Mountains, where the winds get so strong they can easily blow it away during the night. I have used it many times as an extra snow stake for my tent. It punches into firm snow with little effort, and holds quite well, especially when the flat side is turned to face the direction of anticipated pull. I use the adze to chop a seat in the side of the hill while mountaineering, and to pull frozen-in snow stakes out in the mornings when breaking camp. I used it one January to chop through ice and frozen snow to uncover a creek that was still running so as to forgo melting snow. I use the spike as a brake when glissading to control my speed. A decidedly non-recommended usage of the spike occurred near White Mountain on a trip in May 2006. We set up camp in an exposed snow-free area of arctic tundra type terrain. I had used every stake I had with me to set up the tent as the wind was blowing 17 mph (27 kph). My gaiters were soaked with sweat and condensation, and I wanted to dry them before sticking them back in the pack. I stuck the Raven into the ground and threaded the heel straps over the shaft, where they blew in the wind, dry quickly. Here is a picture from this trip of the Raven on my summit pack. The only time I have ever needed it in a �real� situation was coming down from Shasta in 2005. It was 13 F (-11 C) and the snow was firmly packed. I was just starting to glissade below the Red Banks at around 13,000� (3962 m) when Dave sat down right in my path of travel. I knew I was going to hit him and know that he was very concerned about his ability to self-arrest. So I leaned on my back twisting to the side, and swung my Koflach-clad feet up in the air. I just cleared his head. The result was that I shot down the mountain on my back, picking up speed fast! I positioned the Raven in my hand and flipped over on my stomach, and dug in the way I had trained. I came to a stop just like I was supposed to. I remember the immense relief at knowing that it really does work. I did not want to have to do it again though. I like the Raven Pro a lot, but may try one of the new generation carbon fiber shafted axes in the future. Until then I expect the Raven to continue to be my steady winter companion. Here is a picture of me with the Raven in hand, about to be slammed by a storm on Shasta.